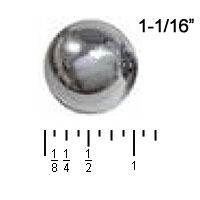 Standard size used pin ball- 1-1/16-inch diameter- for use in most all flipper pinball games. Still lots of life left in these. Great replacements for badly worn, badly pitted, or rusted balls, or for use in a game you may just be selling and passing-on as-is. Also ideal for hobbiests who like to polish and rejuvenate old balls to new condition with a tumbler. Used balls are in average used condition. No rust or major damage. Most will show some signs of average previous use. This item also available new- part # PB116.